Details: Hants and Dorset Trim of Eastleigh undertakes many refurbishments and repaints of London buses. 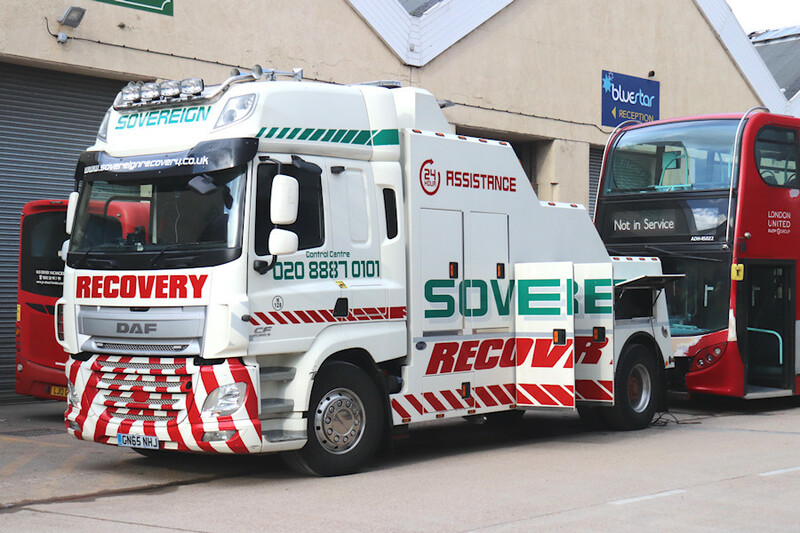 On 2nd April 2019 Derek was visiting their base (adjacent to the Bluestar garage) and photographed Sovereign Recovery DAF CF GN65NHJ having recently arrived with London United ADH45022 on tow. The only noticeable change to this 2-axle tow truck since it was new in 2016 is the addition of fleetnumber H128. Parked behind the truck is Go-Ahead London Wright Streetlite bus WS31.